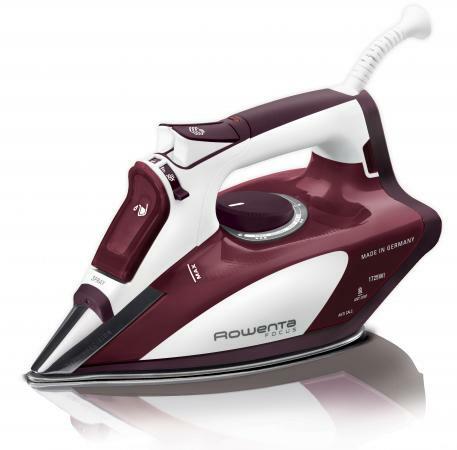 If you're looking for a high quality iron that has powerful steam capabilities, you just might find that Rowenta's Focus Excel® model is exactly what you need. Introduced in September of 2017, this model is an advanced steam iron that does an incredible job. It produces much more steam and irons quite a bit faster than other irons I have used over the years. The last thing I want to do is spend a lot of time ironing my clothes, so I was really excited when the Rowenta team asked me to check out the brand's new Focus Excel model with expanded steam capabilities. I was a bit skeptical of their claim that the iron produces up to 2X more steam coverage than some of their competitors, but it only took one use of the iron to realize that this iron is unlike any I have used in the past. While I certainly haven't tried every iron out there, I have tried several different irons in the past, and have always been disappointed in how little steam they put out. That is not the case with this one at all! Exactly as stated on the package, it puts out "a powerful shot of steam" that makes easy work at eliminating even the most stubborn wrinkles and creases. In looking at the iron's design, it's easy to see how this is possible. That's because the plate on the bottom of the iron has a lot more holes for steam distribution than I have seen on other irons. Rowenta calls them 'microholes' and there are 400 of them spread out across the iron's soleplate. It has an easy-to-press trigger that releases a burst of steam whenever you need it. While the most powerful steam available is sometimes exactly what you need, that isn't always the case. Fortunately, this iron has a variable steam system, which lets you adjust the output of steam independent of the fabric setting you have selected. It also allows for vertical steaming, which means you can use the iron to steam clothing that is on hangers, as well as to easily steam things like drapes and fabric shower curtains. In my experience, I can effectively iron a wrinkled cotton shirt in about 25% less time than it would take using my old iron, which is not a Rowenta and is about 12 years old. To me, the time-savings alone makes this iron a terrific option. Easy-handling: The iron is very sturdy, with a right-sized handle that is easy to grip. Water tank visibility: It's easy to see how much water is in the tank so you don't have to wonder about whether you need to add water or not. The fill line is clearly marked and labeled with "max" so there is no question about whether or not the iron has been over-filled. Stay dry cover: There is also a cover that snaps closed on top of the water tank, which helps keep water from sloshing out while you iron. Precision tip: The iron's tip comes to a thin point, so you can easily iron areas that are often hard to get to when ironing, such as seams, collars, and area surrounding buttons. Easy maintenance: This iron is self-cleaning with an Anti-Calc collector that prevents calcium and limestone particles from building up to cause clogs. Note that you will need to clean the Anti-Calc valve every two months. Automatic off: The iron will automatically turn off after eight minutes when it is sitting upright. If left sitting in ironing position (with the soleplate down), it will turn off after 30 seconds. Whether you iron every day or only occasionally, this is a terrific iron to consider. It makes short work of even tough ironing jobs, and it is very easy to operate. It is by far the best iron I have ever used. Note: The author received a free iron from Rowenta for review purposes. The opinions in this independent product review are her own.